Greek weddings are famous for a reason and this Greek wedding was no exception. We had the opportunity to explore it on a sunny day near Thessaloniki, the charming city in north-eastern Greece. 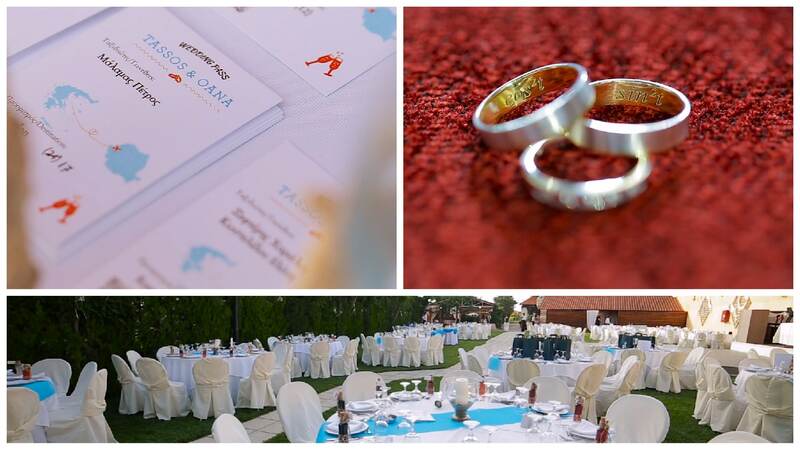 Here, Oana and Tassos celebrated their wedding on the lively rhythms mixed by the DJ’s at the Aroma Zois restaurant, a lovely outside place perfect as a destination for enjoying the warm Greek nights. The story of this couple is one that is very special and spans three different countries and cultures. Oana is from northern Transylvania, while Tassos is from Thessaloniki. They met in college in Brussels, Belgium, through a student association called BEST. Sharing the same passion for travelling, they decided that their greek wedding would be an event that reflects that. So, their guests got a very special wedding invitation – in the form of a boarding pass. And that was really suitable, because many of them were from far away countries: Sweden, Germany, South Africa, – and the list goes on. Our first discussions with them were through Skype, as they were still in Belgium. 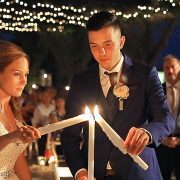 In the wedding clip, there are actually moments from their two events, one in her city and the big celebration in Thessaloniki. But we will focus on the latter one in this post. After all the details were planned, not much time passed and we found ourselves on the way to Greece, passing through the Balkan countries I so enjoy visiting. Before arriving at the destination, we stopped for a couple of days at Meteora – one of Greece’s top attractions – for a filming project. The restaurant is situated just outside Thessaloniki and, besides the big elegant garden, it features a lounge, a cocktail bar and a selfie corner (always great fun for the guests). Of course, the core of the event was outside, where everybody danced on the different genres mixed by the DJ’s. Regarding the music, it reflected the diversity of the event, with Greek, retro but also modern rhythms. The highlight was the song “Simply the best”, which is also the hymn of the “BEST” association where the two met. So the whole group of friends sang along, making for a truly special moment. In a more chronological order, the event preparations started in Tassos’ apartment. We arrived earlier, however, this turned out to be great fun. Tassos’ mother spoiled us with delicious cherries and traditional Greek deserts (which we can write a whole other article about). Meanwhile, his father invited us to watch along the 2016 European Championship. After the preparations, there was a short religious ceremony the majority of guests also attended. The start of the party at around 8 was marked by a special dance of the wedding couple. It then went on in full motion, with a lot of dance and fun. This Greek wedding was a very interesting and enriching experience for us. From traditional things such as roasting lambs outside to the specific Greek music and dances, everything was a welcomed novelty. But there were other particularities as well. At the event held in Transylvania, the couple wore minimalist connected wedding crowns. And for math enthusiasts, their wedding rings were engraved with cos2t and sin2t which (refreshing high-school memory) equals 1. At the end, the parents also took the time to thank us personally, which we were very grateful for. But looking back, we feel that we are also the ones who should be thankful, because we have the opportunity to follow our passion and attend such amazing events.